Continue to Write New Chapters for the "Golden Era"
How time flies! This is the seventh Young Icebreakers’ dinner I have attended. · This is a gala for all Young Icebreakers. 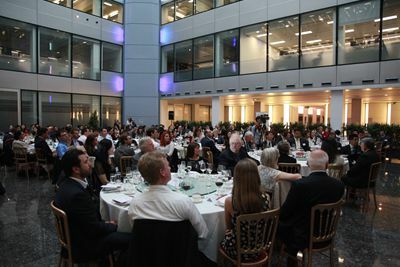 · This offers a platform for friends who care about China-UK ties. · This enables those of us committed to China-UK friendship and cooperation to engage and share thoughts and information. · And this also gives me an opportunity to exchange views with all of you and envision the prospects of China-UK relations. This year is the opening year of the “Golden Era” of China-UK relations. Since the beginning of the year, both China and the UK have worked actively to follow up the outcome of President Xi Jinping’s State visit. We have been engaged in advancing cooperation across the board. Our cooperation has a number of highlights. 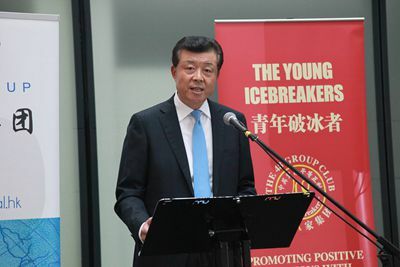 · President Zhou Qiang of China’s Supreme People’s Court paid a successful visit to Britain. This visit, through exchanges and mutual learning, has helped enhance the judicial cooperation between our two countries. · China and the UK also held the first high level security dialogue last month. During this meeting the two sides agreed to cooperate and fight against terrorism, cyber crime, organized crime and so on. · Foreign Minister Wang Yi came to Britain in early February for the Conference on Supporting Syria and the Region. · Minister of Supervision Huang Shuxian attended the Anti-Corruption Summit in London. · And the UK’s Foreign Secretary and Chancellor have also paid visits to China. · China’s Ministry of Finance successfully issued and listed a three-year, three-billion RMB bond in London. · This is the first time China issued a sovereign bond in an RMB offshore market overseas. · This will prove to be a boost to China-UK economic and financial cooperation as well as London’s position as an RMB offshore center. · It will also serve to facilitate the process of RMB internationalisation. 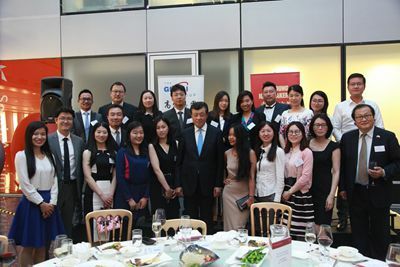 · Moreover, the past weeks also witnessed here in London the China-UK Business Leaders Summit. 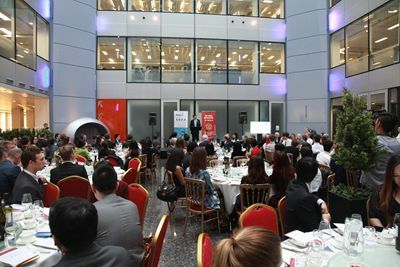 · This was followed by the Sino-European Entrepreneurs Summit. · And there was also the China Merchants Bank opening of its first London branch. · Our two countries have co-hosted a series of events to jointly commemorate the 400th anniversary of the death of Tang Xianzu and William Shakespeare. · These two literary giants from the same historical period are masters of the oriental and western literature respectively. · They are the best representatives of the rich culture heritage of our two countries. · And their extraordinary standings in history highlight the meaning and significance of our joint commemoration which extends beyond our times. All in all, we have had an excellent start to 2016. The China-UK relations are full of momentum. Although this expression is widely attributed to a “mysterious Chinese curse”, no equivalence in Chinese has ever been found. But whatever its actual source, I think indeed it seems we are now living in an interesting time. Last week, the people of UK voted to leave the EU. This was very much a “black swan event”. The Referendum result has triggered shocks in Britain, Europe and the world. Here today, I am giving my first speech on China-UK relations after the Referendum. · We respect the choice of the British people. · We respect Britain’s independent choice of its own development path. · And we hope the UK and the EU will consult and negotiate and reach an early arrangement that is acceptable to both sides. I would also like to reiterate China’s unchanged commitment to stronger China-UK ties and closer China-UK cooperation. First, China values its relations with the UK. This position remains unchanged. Whether the UK is in the EU or not, we will take a strategic and long-term perspective when it come to China-UK ties, as we always have done. Our view has been consistent. China and the UK are countries of global influence. A healthy, stable and win-win China-UK partnership serves not only the fundamental interests of the people of our two countries but also the peace and prosperity of the world. We hope that, regardless of any British domestic political changes, a positive relationship with China will remain the consensus for both the UK government and opposition political parties. We also hope that, despite any possible foreign policy adjustments here in the UK, advancing ties with China will continue to be a priority of the UK government. The second point I want to make is that China remains committed to business cooperation with the UK. This position remains unchanged. People from both Chinese and British communities have been asking me this question: Will the result of the referendum have an impact on investment from Chinese businesses? · Given the immediate market fluctuations and uncertainties, the Chinese businesses will inevitably need to be more prudent and stay cool-headed. · But in the long run, there is no way that our bilateral cooperation should be allowed to go down. · We are respectively the world’s second and fifth largest economies in the world. · That means we have so much to offer for each other. · And there is huge potential for cooperation. On June 25, just one day after the referendum result was announced, Tianjin Airlines, a subsidiary of China’s Hainan Airlines Group, opened a direct flight route connecting Tianjin, Chongqing and London. This new route followed the launch of direct flight from Beijing to Manchester by Hainan Airlines on June 10. These business moves sent a clear message that Chinese businesses have confidence in the British market. They testify to the fact that, on China-UK relations, China is taking a long term perspective. I am confident that Britain will do all it can to strengthen its economic standing, to attract foreign investors and to keep its door open to Chinese businesses. We hope that the British side will continue to advance cooperation with China on investment and trade in an open and pragmatic manner. My third point is that China continues to attach importance to its cooperation with Britain on global issues. This position remains unchanged. China and the UK are now engaged in a global comprehensive strategic partnership for the 21st century. This is a strategic choice that our two countries have made. It is based on our respective international responsibilities and obligations. In the coming September, China will host the G20 summit in Hangzhou. We look to work with all the other member states to boost global growth and improve world economic governance. We also look to Britain’s support and contribution to the summit. It is also our hope that China and the UK will reinforce our cooperation on a series of global issues, including sustainable development, counter-terrorism, anti-corruption, anti-microbial resistance, etc. China and the UK, working together, have a great deal to contribute to the peace and stability of the world and the sustainable development of humanity. Today, the UK is sailing into uncharted waters. I hope that on this unprecedented voyage, the UK, with the known resilience of its people, will cut through the mists, steer around the shoals and ride through the waves going forward. I also hope China-UK relations will sail steadily forward in the right direction, and China and the UK will continue to write new chapters for the “Golden Era”. In this way we will bring benefits to the peoples of our two countries and beyond. Let us work together to make this happen!